Do you like shiny things? Is your gem collection missing that one beautiful stone to pull it all together? In Splendor, you lead a Merchant Guild competing to produce gems and win the attention of Nobles in your town. Show them you’ve got the most beautiful – and valuable – collection of gems in the province, and you’ll win their hearts – and purses! This recent release from Space Cowboys combines resource-management and set-collection in a Renaissance-themed game for 2-4 players. 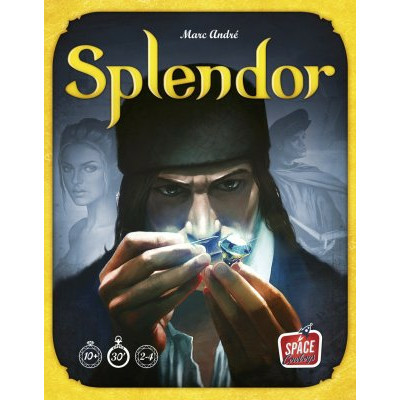 Splendor provides a pleasant number of tough choices, particularly for a game purposely designed to be easy to learn and with only a few available actions each turn. If the Merchant in you is already counting coins, read on! In Splendor, players are competing to score the most points before the game ends. The first player to score 15 points triggers the final round, after which the player with the most points is the winner. Points are scored by collecting locations that produce gems, and by earning visits from Nobles who are swayed by the beauty and value of your collection. Splendor is set up in three distinct parts. First, the “gem tokens” and the yellow gold tokens are stacked by color. In 2- and 3-player games, some gem tokens are removed from play. Second, the “Developments” are built by separating and shuffling the three distinct development decks, then dealing 4 cards from each deck face-up on the table next to their deck. Third, a number of “Nobles” equal to the number of players plus one are randomly selected and placed face up on the table. 1) Take 3 gem tokens of different colors (1 of each color). 2) Take 2 gem tokens of the same color (if there are at least 4 of that color available). 3) Build a development card by spending gem tokens. 4) Reserve a development card, and then take a gold token if one is available. The starting setup, from a fancy angle. Players take turns performing actions until a player scores at least 15 points, which signals the last round of the game. Most development cards are worth victory points, and represent the main way players score points during the game. Players may buy face-up development cards from any of the three decks. Though the high costs of the cards in the second and third deck typically preclude their being built early in the game, these cards are worth the most victory points. Additionally, Nobles are worth a set number of victory points, and can be claimed by the first player to build specific numbers of different colored developments. Each Noble requires a different mix of developments to be scored, and can only be scored at the end of a player’s turn if the required developments have been built. Nobles typically provide a substantial boost to the winning player, and represent a communal goal that players pursue. Because each player starts with no gem tokens and no developments, the first few rounds of play are typically devoted to collecting gem tokens and purchasing low-cost development cards. Every development card has a cost in gem tokens and a gem it produces, and acquiring these development cards is the key to victory. Note the gems on the top-right corner of each development card. Every development card already built by a player lends its gem to the available total for buying more development cards. For instance, if a development card in the market costs a red gem token and a white gem token, and a player has already built a development card that produces a red gem, then the new development card will only require the player spend the single white gem token. In this way, players can build an “economy” of gem tokens, with an eye towards purchasing the more expensive development cards in the second and third decks. No player may have more than 10 combined gold and gem tokens, and many of the development cards cost more than 10 gems to build, so it’s necessary to acquire low-cost development cards to be competitive later in the game. Also, Nobles are scored only when players have built a certain number of development cards that produce specific colors of gems. Building development cards is the main pursuit of Splendor, and all strategies for victory revolve around efficiently acquiring then capitalizing on them. Today on Mauri: Nobles, and the developments that attract them. Though it’s impossible to build expensive development cards early in the game, it is possible for a player to “claim” them by spending the turn’s action to take any un-acquired development card into their hand. The claimed development card can be built for a turn’s action at any point later in the game, provided that the player spends the appropriate gem tokens. Players may only have, at most, three reserved cards at one time, and may never discard them. When a player reserves a development card, that player also gains a gold token (if any are available). These gold tokens are “wild cards” that can be spent as any color gem. The combination of reserving cards and acquiring gold tokens is, in my experience, incredibly important. At the start of the game, only four development cards are revealed from each deck, and are replaced one-at-a-time from the appropriate deck as cards are built. This means it’s difficult to build towards expensive development cards, as all players have the ability to build any unclaimed card on their turn. Claiming a card allows a player to build towards a certain goal, and removes some of the risk of being stymied by other players’ actions. Also, the gold tokens are incredibly useful as wild cards, and allow for significant flexibility during the game. I thoroughly enjoyed the first game of Splendor I played, and palled at the second. I’ve given considerable thought to this, and the best explanation I have is that Splendor feels like a really interesting mechanic that’s looking for a great game to be built around it. I enjoyed managing my economy of gems (much like managing factories in Power Grid, on a much simpler scale), and I found it interesting to plan around other players’ choices. On the flip side, once I realized that the development cards were perfectly symmetrical - meaning that there are equal numbers of cards of each color, with identical distributions of gem costs – I lost interest in playing. It feels somehow solved, like it’s possible to calculate a “best” move given a specific game state. I’m not sure it’s actually possible to do, and I certainly couldn’t do it during the flow of a game, but that feeling makes me enjoy the decision-making process much less than I otherwise would. It’s not an indictment of the game design by any measure, but it does feel like Splendor lacks the depth that an additional layer of design could add. Boros, Dimir, Grixis, oh my! On the bright side, Splendor fits into a very important niche in my game library – games that can be taught quickly and offer players a small set of choices each turn, but that require long-term strategy to win. Ticket to Ride is the flagship game in this genre, and Splendor is another excellent selection. I recommend Splendor to those game groups looking for a quick, sleek game (the components are of FANTASTIC quality) with moderate strategy that’s easy to teach. 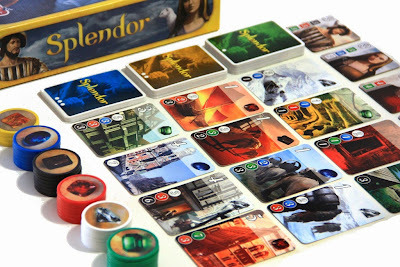 I would recommend that fans of “heavier” games give Splendor a few plays before making a purchasing decision. As I mentioned above, I was initially enamored with the game, but that faded as I realized the game was effectively randomly decided if all players played reasonably well. Still, I think Splendor is a worthwhile game, and I commend Space Cowboys for bringing another “staple” game to the market that isn’t derivative of any game I’m aware of. Also, the game gets bonus points because the five colors of gems are the same as the five colors in Magic: The Gathering, which means that I can say the names of all the guilds when I collect tokens! JR Honeycutt is a full-time husband and game-player, and co-host of The Nerd Nighters. You can find him on Twitter at @JayAhre or at a Friendly Local Game Store in Dallas/Fort Worth, Texas.